Widespread heavy rain over the past 24 hours triggered landslips and uprooted trees, disrupting vehicular traffic in various parts of the state. The 1500 MW Nathpa Jhakri project remained closed for the seventh day today as level of silt in the Sutlej remained over 8,000 due to rain in the catchment. The Chamba-Pathankot National Highway remained blocked for about eight hours due to landslides following downpour last night at Keru Pahad, near Tunnuhatti, about 65 km from here today. The central organisation of the Ex-servicemen Contributory Health (ECH) scheme has withdrawn the direct referral facility from the Yol-based ECH centre. Now, the ex-servicemen who require emergency treatment in super-speciality hospitals in Chandigarh, Ludhiana or Jalandhar have to get their cases ratified from the Chandigarh-based ECH centre. With a large number of seats in 21 private polytechnic institutes remaining vacant after the last round of counselling yesterday, the institutes were now demanding relaxation in the norms. In order to generate employment for the Himachali youth and provide them with qualitative technical education, the government will spend Rs 400 crore during the current financial year on technical education. The annual “Artists at the IIAS” at the prestigious Indian Institute of Advanced Study has provided a platform to creative persons for expressing their view of history associated with the freedom movement, theme for the monsoon programme, using different mediums. The government has constituted a state-level Programme Monitoring and Review Committee under the chairmanship of the director of Social Justice and Empowerment Department to ensure proper implementation of the NABARD-funded project to be executed through anganwari workers. Under the total sanitation campaign (TSC), Naura Gram Panchayat in Kangra has been adjudged the best in the state, bagging the 'Maharishi Valmiki Sampurna Swachhata Puraskar' of Rs 10 lakh for 2010. The award will be presented by Chief Minister Prem Kumar Dhumal at the Independence Day function. The state unit of the Bharatiya Janata Party will stage ‘dharna’ in front of the local CBI office on August 16 in protest against the misuse of the central investigation agency by the UPA government at the Centre to harass political rivals. The CPM has asserted that the campaign to stamp out the menace of ragging from educational institutions will not yield the desired results unless appropriate steps are taken after understanding the genesis of the issue. Decrying the indiscriminate chipping of the hill along the NH-22 for widening the highway, Baljit Malik, an environmentalist based at Kasauli, has termed it as an “ecological disaster”. Health services were hit in many rural hospitals and health centres across the state today as over 300 doctors went on a mass casual leave in protest against their appointment through the Rogi Kalyan Samiti (RKS). The administration here has formed a district-level Disaster Management and Response Committee and a 24-hour-service control room has been set up for the purpose. Surender Sharma, a retired police officer and resident of Hathithan village near Bhuntar was allegedly murdered last night. The rain added to the woes of apple growers as the Theog-Hatokoti road, through which almost half of the total produce is to transported, was blocked at two places. The link roads in Kotkhai, Jubbal, Chopal and Rohru were also blocked, making transportation of produce a nightmare for the growers. The heavy rain also damaged roads in Chamba district. Shimla and the surrounding areas also experienced 68mm rain, which uprooted trees, disrupting traffic on the main bypass road and the Shoghi-Mehli road. Dehra Gopipur had 128mm, Sundernagar 104 mm and Pandoh recorded 98 mm. 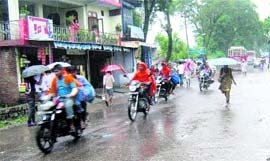 KANGRA: Heavy rains lashed several parts of the Kangra valley on Thursday, leaving most parts of the town flooded. The Kangra-Hoshiyarpur National Highway remained blocked for more than two hours near Bajjreshwari Dham and Pathankot-Mandi National Highway was closed due to landslides at Banooie. Kangra district police chief Atul Fulzele said there was no loss of life reported from any part of the district following heavy rainfall. He, however, confirmed that the Kangra-Hoshiyarpur National Highway was blocked following landslides near Bajjreshwari Dham on the outskirts of the town for more than two hours. He said a bridge also sank on the Pathankot-Mandi National Highway, near Shahpur, leaving traffic disrupted for four hours. More than 400 mm rains were recorded during the past 24 hours here, leaving most parts of the town waterlogged. The water entered houses, hotels and shops in different localities of the town. Meanwhile, fire brigade vehicles were pressed into service to pump out water from the low-lying areas on Dharamsala road and in Jayanti Vihar locality. However, Polytechnic College campus was also flooded as the main drain at the gate of the college was chocked and water from the new bus stand entered the campus. Principal of the college, Verma, alleged that the local municipal committee authorities were requested time and again to get the drain cleared, but of no avail. A resident of Shiv Vihar Tilak Raj Soni said water entered in the houses of the locality because of the government’s apathy as there was no proper drainage system. Same was the condition of Vivekananda Vihar and Jayanti Vihar residents. BL Sharma, spokesperson of the Senior Citizens Forum, alleged that a road passing through Jayanti Vihar was upgraded in June 2008, adding that this resulted in the flooding of the houses in the locality. NURPUR: Torrential rainfall lashed lower Kangra district on Thursday damaging two houses of Dalits at Nagni near here. However, the family members had a narrow escape. The houses of Kushal Kumar and his brother Baso Ram got damaged in the rains. Gram panchayat’s head Kulwinder Singh, who visited the affected families, has sought rehabilitation of the families from the state government. Meanwhile, SDM Inder Singh Bhardwaj said field revenue staff had been asked to conduct a survey of the loss due to the rains and the affected families would be given relief as per the relief manual. Tourists and passengers were stranded during the night hours as transportation services were disrupted due to the road blockades. According to reports, the PWD workforce, including its engineers, was on its toes putting the JCBs into service to clear debris and traffic on the highway that was resumed only before noon. The Sahoo belt of the region, which supplies milk to Chamba town, remained cut off due to the landslides on the Link road affecting milk supply to the town. The Chamba-Bharmour road also remained blocked at different points. Meanwhile, Dalhousie PWD superintending engineer SC Dhiman said a tentative loss to the road network in the district had been estimated at about Rs 20 crore as per the preliminary assessment. Dhiman added that about 15 JCBs had been deployed for the restoration work of roads in the district. KULLU: Four houses and a cow shed were buried under a massive landslide at lower Najan village in Gadsa Valley of this district on Wednesday due to heavy rain. In another flash flood, many houses were partially damaged in Rauli village in the valley. As many as 19 families were affected while a cow was buried alive. Meanwhile, the district administration distributed Rs 5,000 each to the affected families. The rains had also damaged the national highway between Kullu and Mandi today and hundreds of vehicles were stranded on both sides of the road near Hanogi Mandir, about 50 km from here. The flights from Delhi to Kullu and back were also cancelled due to heavy rains and poor visibility. This has caused resentment in ex-servicemen who are alleging that they are being discriminated. Citing cases of harassment they alleged that Punia Devi, wife of an ex-serviceman from Kangra, had met with an accident. She was in coma in a Chandigarh-based hospital. However, the ECH centre authorities at Chandigarh have refused to extend her case for stay in the hospital. Punia was not the only case. Now, in case of emergencies we first have to travel for about seven hours to Chandigarh and then to local ECH centre there before getting treatment. Jalandhar is nearer for patients of Kangra than Chandigarh, however, we are being forced to take longer journey, ex-servicemen alleged. The central organisation of the ECH has recently withdrawn the referral facility from Yol ECH. Kangra district has a very high concentration of ex-servicemen and there is only one ECH centre at Yol. Earlier, the patients used to be referred directly from Yol. There are 48,367 ex-servicemen in Kangra district. Out of them 26,000 are already members of the ECH scheme. This takes the number of ex-servicemen and their dependents covered under the ECH scheme to about 70,000 people in Kangra district. Under the scheme, the ex-servicemen have to pay one-time amount ranging from Rs 1,800 to Rs 18,000 depending upon their rank. After becoming a member of the scheme, they are entitled to free treatment at the ECH centres and other empanelled hospitals. According to sources, high bills raised by Chandigarh-based hospitals may be one of the reasons due to which referral facility has been withdrawn from the Yol ECH centre. In the last one-year 522 cases were referred from the Yol ECH to Mukat hospital in Chandigarh. 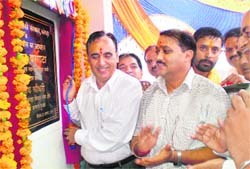 Mukat hospital has been paid Rs 2.94 crore for the services. As many as 654 cases have been referred to Fortis Hospital, Mohali, that has cost Rs 1.34 crore and 280 patients have been refereed to Grifon Hospital at a cost of Rs 1.54 crore. As per the existing norms, matriculates having less than 50 per cent marks were not eligible to seek admission in the various technical courses. This was contrary to the norms in the neighbouring Punjab where matriculates could take admission without any minimum percentage eligibility norm. This restriction is leading to exodus of students to Punjab where they secured admission easily thus depriving the institutes in Himachal of adequate student strength. The situation was aggravated by the late declaration of results of ITI courses and since no student could procure admission without appearing in the entrance examination, they would lose a chance. These polytechnic institutes ran three-year courses in various disciplines. The private institutes were demanding relaxation in the compulsory entrance test norm for the hundreds of ITI students and demanded that they should be granted lateral entry in the polytechnic courses. They also demanded that some relaxation in the minimum norm of 50 per cent marks in matriculation should be given to those students, who had cleared plus two. This would enable more students to seek admissions in these courses thus putting an end to their exodus to Punjab. Chairman Private Polytechnic Institutes Association CS Awasthy said the government should consider granting these relaxations as this would ensure ample student strength in all private polytechnic institutes. Bound by these norms, a number of private institutes had failed to get adequate students in the last session which made it difficult for them to even meet their recurring expenditure, including staff salaries. He added that since no such norms existed in the institutes in Punjab, a large number of students who failed to get admission here were now securing admission there. This had defeated the very purpose of opening 21 private institutes here. This was stated by the Minister for Technical Education Narender Bragta, addressing a function in polytechnic college today after inaugurating a girls hostel, a project of Rs 1.26 crore, to accommodate 45 girl students on the college premises. He said five polytechnic colleges would be started at the cost of Rs 62 crore in Kullu, Bilaspur, Sirmour, Kinnour and Lahul Spiti districts of the state. He said besides four ITIs at Bilaspur, an engineering college would be set up at Shimla. He said Rs 10 crore would be spent on the construction of two hostel building for boys and girls in polytechnic college here. He said 222 posts of technical teacher had been sanctioned and would be filled soon in order to provide qualitative technical education to the youth of the state. He announced Rs 5 lakh grant for the repair of official quarters and Rs 5 lakh for construction of an overhead water tank. Students presented cultural programmes on this occasion. Selected artists from all over the country are busy creating colourful thought-provoking visuals on the canvas related to freedom movement, particularly the Partition and other event to which the majestic Viceregal Lodge building, housing the institute, has been a witness. While all artists are working on images of events with the imposing building in the backdrop, famous installation artist from Goa Subodh Kerkar is creating a sculpture to depict the irony of cultural divide which was akin to separating the body from the soul. “The biggest paradox of the Partition is that important places where the Indian culture evolved and flourished like Takshila, the greatest centre of learning, the Sindhu river, on banks of which Upnishads were written and Mohan Jodaro and Harappa, the seat of Indian civilization, have all gone to Pakistan. On the other hand, the most stupendous specimen of Mughal architecture like Taj Mahal have been retained in the country”, he pointed out. It has been entirely an unrealistic and rather artificial separation which will find expression in his metal sheet sculpture in which the “form of dancing girl of Mohan Jodaro” will be cut out from one part of the sheet and erected with the help of rail lines on the other part. He had chosen the rail line as Mohan Jodaro was discovered while the British were carrying out excavation to extend rail network, Kerkar explained. Kanu Patel from Gujarat is focussing on the 1945 conference convened by Lord Vowel to prepare the blueprint for the Partition, while Suman Gupta from Jammu is capturing a moment depicting a thoughtful Mahatma Gandhi sitting at the entrance of the heritage building. 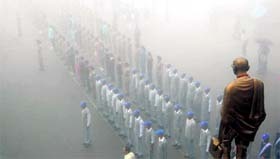 The visual being created by Ajay Jaitley from Allahabad has a surfeit of Gandhian caps symbolising the philosophy and vision of the great leader. Director of the institute Peter Ronald de Souza said the whole idea behind making the event an annual theme-based feature was to show history and events in a different light from the eyes of artists. Chief general manager of NABARD and lead manager, general manager of UCO Bank, have been nominated as members, while the Joint Director of Social Justice and Empowerment Department will be the convener of the committee. A spokesperson of the Social Justice and Empowerment Department said here today that NABARD had sanctioned a Rs 42 lakh project for promotion, nurturing, savings and credit linkage and monitoring of self-help groups through anganwari workers, who would work as individual rural volunteers. Awards under the TSC for best panchayats at divisional, district and block levels have also been announced. In all, an amount of Rs 1.47 crore will be disbursed in the form of cash prizes to winners. The divisional-level award carries a cash prize of Rs 5 lakh, district-level Rs 3 lakh and block-level Rs 1 lakh. At divisional-level, Bhari Pharnol Panchayat (Hamirpur) in Mandi, Mindhal Panchayat (Pangi block) in Kangra and Himri Panchayat (Basantpur) in Shimla division were adjudged the best. District-level winners included Dulchera (Bijhari), Bakora (Jhanduta), Sagnam (Spiti), Vashing (Kullu), Doghi (Bangana), Pukhri (Bhatiyat), Bhont (Mashobra), Baunal Kakog (Sangrah), Namagya (Pooh, Panjehra, (Nalagarh) Sanan (Kunihar), Barswan (Balh), Jai Devi (Sundernagar), Gabli Dari (Dharamsala), Ansoli (Kangra), Samoli (Rohru) and Manubhavia (Chopal) have emerged as winners. The awards have been instituted to help achieve the goal of safe and hygienic environment in the rural areas for all. The panchayats, which have achieved the target of becoming ODF (open-defecation free) and have made provision for solid waste disposal, wastewater disposal, water-harvesting projects, plantation and school sanitation, are eligible for the awards. Till date, 2,792 out of 3,243 panchayats have been declared as ODF. The CPM urged the Chief Justice and his team to be more pragmatic and leave the bureaucratic methodology to get rid of the menace. LR Institute in Solan which has publicly stated that it would not allow any democratic process or rights to students, required to be dealt with severely. At the same time involving the students representatives in the campaign against ragging was important. He further said it was lamentable that no sign board was put up to inform passers-by as to what activity was underway. He said as per the available geological studies, hills lying between Parwanoo and Shimla were not firm and, hence, could not withstand such indiscriminate damage. Surprised by the large boulders which fell down off and on, he said undertaking such straight cutting of the hill during the rainy season was a “blunder” as it endangered the lives of the passers-by. Inviting land slides, it would lead to obstruction of this crucial road thus halting traffic and inconveniencing the general public. The Parwanoo police after receipt of his complaint has directed the private construction company to ensure that large boulders which rolled down were cleared so as to assure the safety of the passers-by. Being a centrally aided project whereby the NH was being converted into a four-lane carriageway, the authorities could do little to stop the project. However, requisite directions were passed to the construction company to erect boards informing about the work underway, the additional SHO, Parwanoo, said. While the government remains firm on its stand, the doctors further threatened to resign in protest if the system was not abolished and they were not regularised in three years. Many hospitals in the rural areas in Mandi, Kullu, Bilaspur and other districts were the worst affected. The doctors were protesting against the government policy of appointment through the RKS done by the BMO, which is not authorised to appoint doctors. Supported by the HP Medical Officers Association (HPMOA), the RKS and contract doctors said some bureaucrats in the health department were misleading the government and were responsible for the poor state of health services in the rural areas. The protesting doctors have decided to hold a meeting at Bilaspur on August 16 to decided the next course of action. HPMOA general secretary J N Chauhan said both sides should come to a negotiating table in the interest of patients. The doctors demands were genuine and the government should consider their demands before taking any drastic steps, he added. Health Minister Rajiv Bindal said they had not accepted their casual mass leave and would take action. “We have conceded their genuine demands, gave them extra benefits to serve in the rural areas, increased PG seats and decided to appoint 150 regular doctors through the HPPSC. Their other demands are not acceptable”, he added. K K Indoria, SP, here said a case had been registered under Sections 302, 457 and 380, IPC, and investigations were on to nab the accused. The SP further said the victim was attacked with a sharp-edged weapon killing him on the bed while he was asleep. The police had found the clues and the culprit would soon be nabbed, he added. The body of the victim had been sent for the post-mortem examination. In yet another case, one body was found under suspicious condition at the local truck union stand here today. The police said the person was identified as Ravi Kumar (40), a driver and resident of Panchot village of Bhuranj tehsil of Hamirpur district in Himachal Pradesh. The cause of the death would be ascertained after the post-mortem examination reports, the SP added.